So Fighter and I were invited to Green Guardian last week. 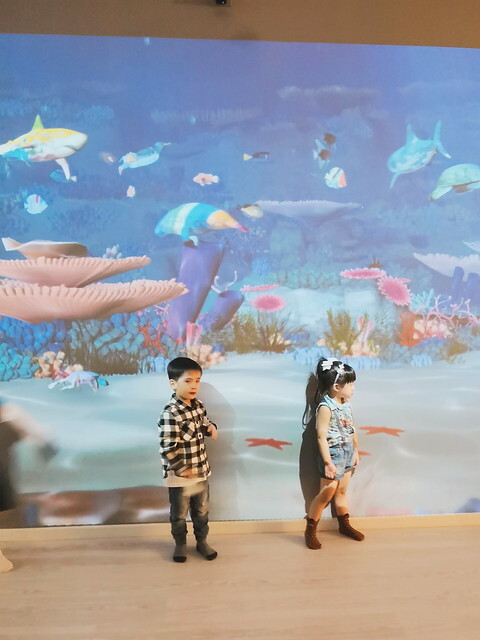 Green Guardian is a special education center that aims to educate kids about different environmental themes , via educational and entertaining content. 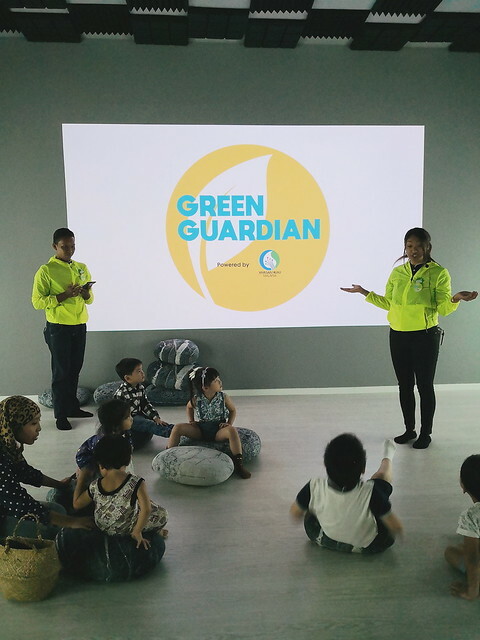 I thought it was very cool how Green Guardian focuses on environmental awareness, cos the future generation (and its parents) needs to not just be aware, but internalize the importance of taking care of the Earth. Fighter has been learning about recycling, and reducing, and saving Mother Earth at school too so this program is a great complement to his learning. If you see the picture above, the walls are all covered in interactive projections! 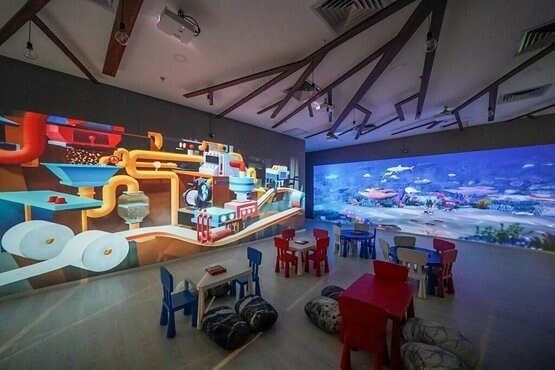 That’s because the center is equipped with state of the art technology and simulation effects to create an enchanting learning experience. 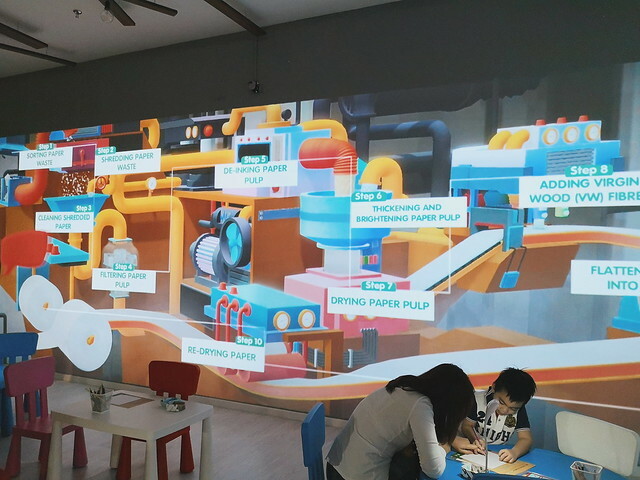 Their programs are designed for children aged 5-12. But Penny is super FOMO so she and Fatty tagged along. 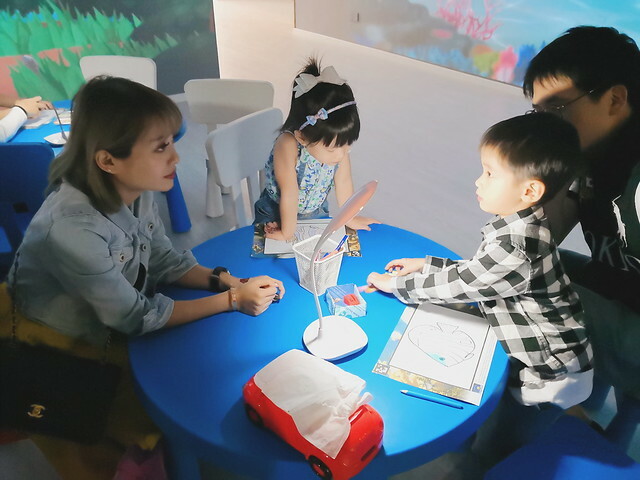 At her age, some of the concepts went over her head, but she had fun anyway cos the games and things are very nice la hahaha. Because Fighter is five, we did the Curiosity Class (for 5- 8 year olds). We went through 4 stops in total, each detailing a different aspect of saving the environment. First stop was ocean based! 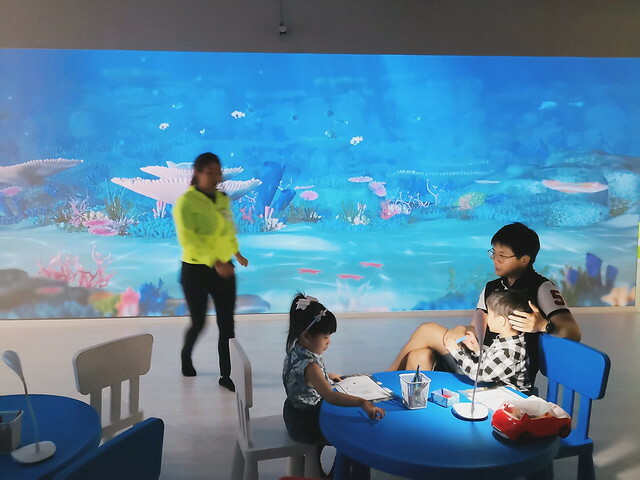 It’s called Love Our Ocean, and the game consists of an interactive projection of the sea on the walls. 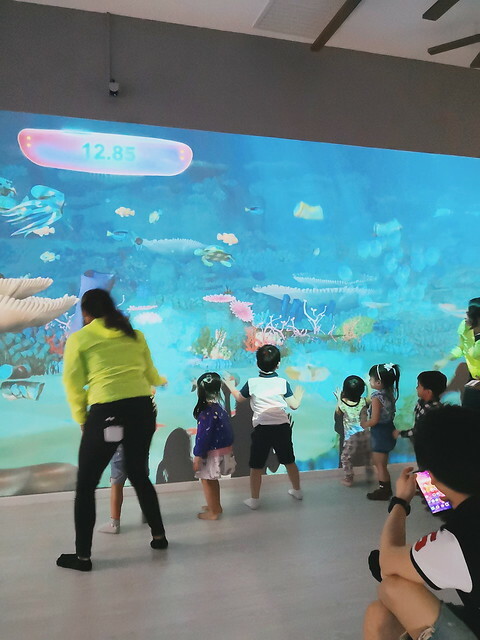 The kids each chose a sea creature, colored it in and scanned it into the program so their virtual fish would join the sea and swim around. But then trash started dropping from above! Dammit humans wtf. So the kids had to run up to the ‘sea’ and hit the falling trash to destroy them and save the ocean and their fish hahahaha. Second stop was actually my favorite! The kids moved to a special interactive room, and got cushions that look exactly like pebbles to sit on. Hahahaha sorry I just need to say this cos I thought the pebble cushions are damn cute. 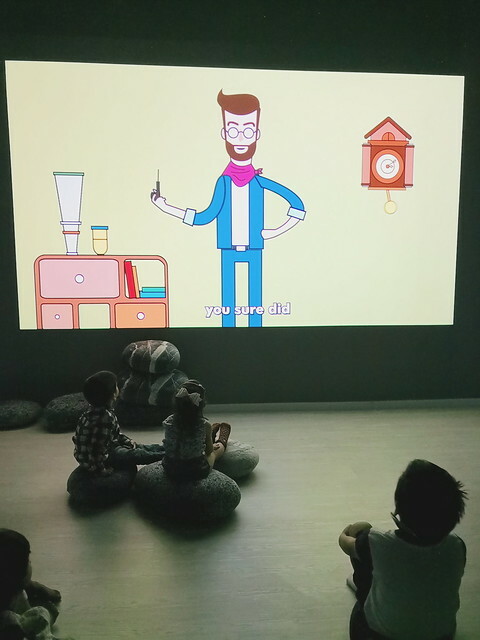 They watched a video about how we use electricity at home, and how we sometimes end up wasting a lot of energy because of our behavior, eg. not turning off lights when we leave, not closing fridge door (the critters always do this *hard stare*), not optimizing the aircon so it’s always on full blast even if we don’t need it, etc. 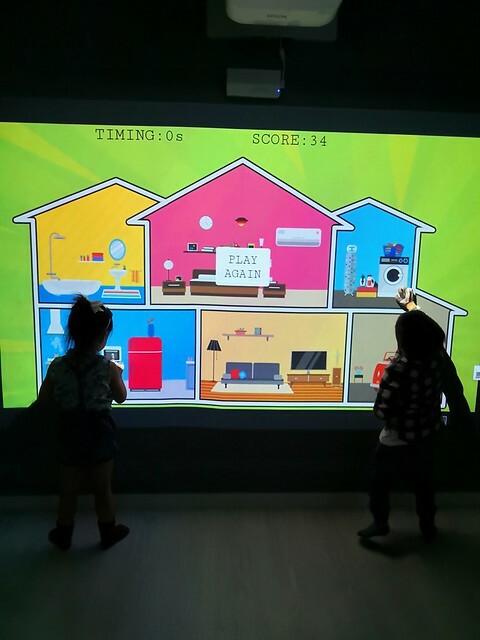 Then they played a couple of games: this one is a house where the shower keeps turning on, stove also boiling, fridge door keeps opening, TV on etc lolol. Their job is to turn off all these things as often as they can within the time frame. 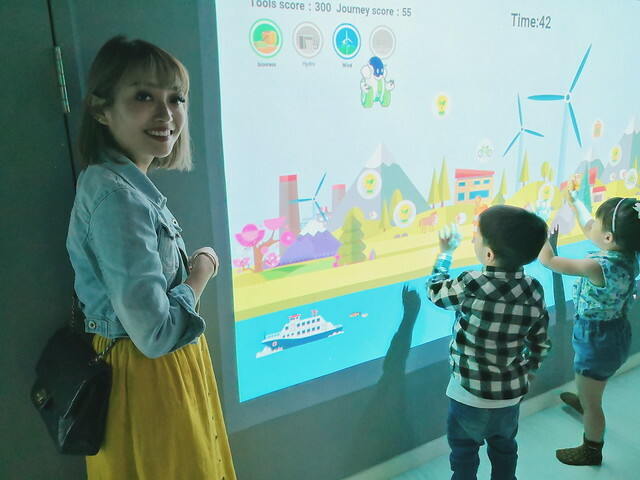 Second game was they had to control this robot avatar to jump over oil tanks and other nasties (I think) and collect things like solar power and wind power hahaha. This one I don’t think they completely understood, and they had trouble with their timing also but look at them damn absorbed please. Third stop was The Earth. 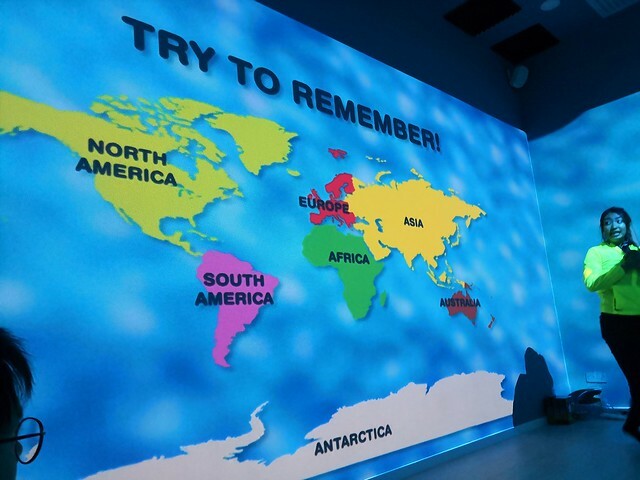 They learned about the different continents and even played a little quiz. Penny actually got South America right but I swear it’s because it’s pink (the color of her obsession wtf). My play by the rules son raising his hand to answer a question lolol. Hugging me cos everyone clapped for him when he answered right hahahaha. Penny hugging me from behind cos again she FOMO hahahaah. Passed by this cosy reading nook on the way to the 4th and last stop! Later I found out that this reading spot is part of Green Guardian’s ‘One for One’ program, which encourages children to swap books or other reading materials to preserve the environment and promote a reading culture. The 4th stop was about Recycling. Specifically paper recycling. 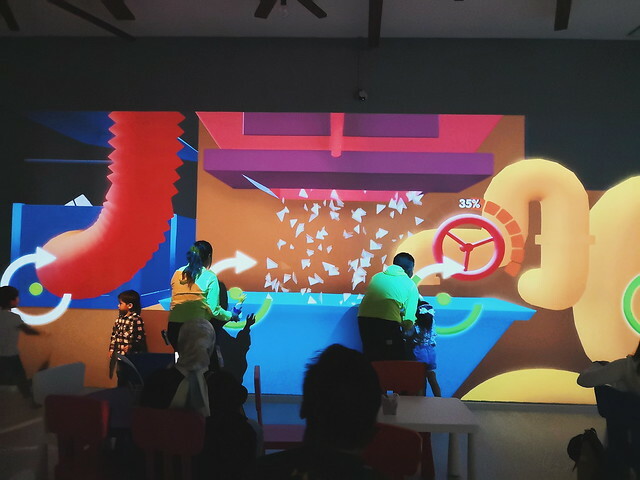 The module went through the main steps of paper recycling and the kids completed mini games in relation to those. Like this! Turning the wheel to shred the used paper. Finally the mission is over! 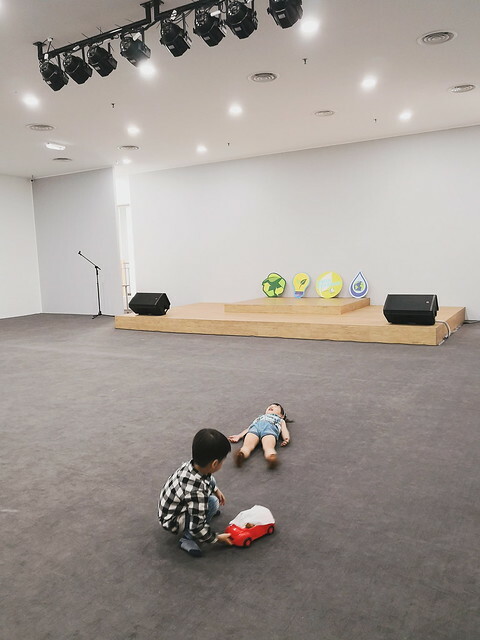 Hahahaha the kids found an unoccupied space and chilled out lolol. Group picture with the other kids and teacher Tina! Tina was very good too – bubbly and energetic and good at engaging the kids. Group photo with all the parents! I’m posing with one boy and one earth worm wtf. I was actually very impressed with Green Guardian! The place was clean and bright, and the equipment top notch. It’s a great, educational way to fill their free time! I liked that they focused on environmental awareness cos it’s a very relevant topic and it’s never too early to start teaching kids. 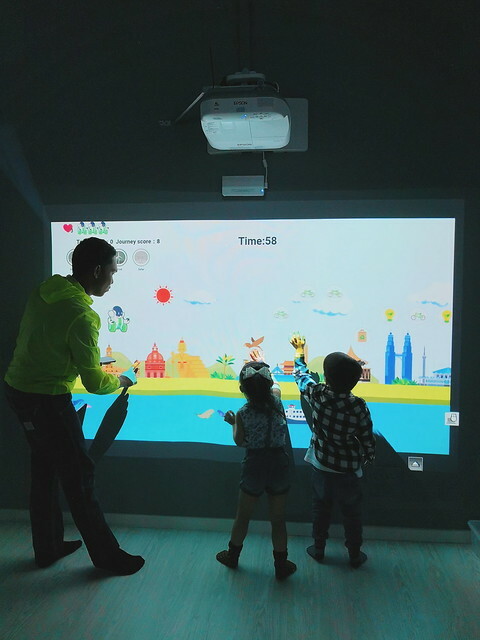 And they made everything very age appropriate and fun – the kids could perfectly understand the importance of caring for the earth. In fact, they took it too seriously already, I’m in Vancouver now but I saw on IG that they didn’t even let Fatty watch TV or turn on the AC cos they said save electricity FHL HAHAHAHAHAHA. 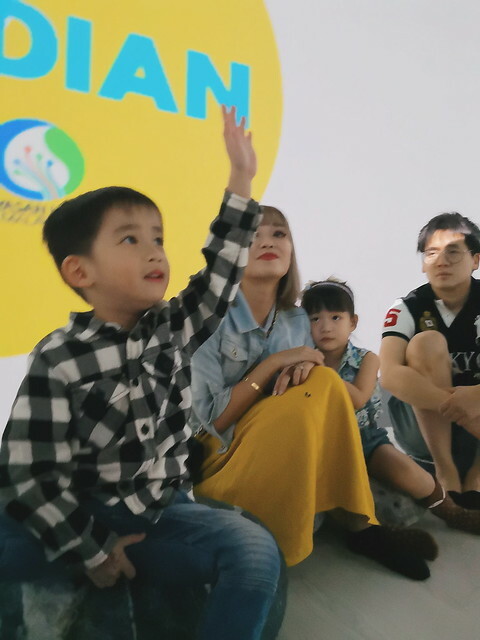 So if you’re interested in taking your kids to Green Guardian education center during the upcoming school holidays, please do! 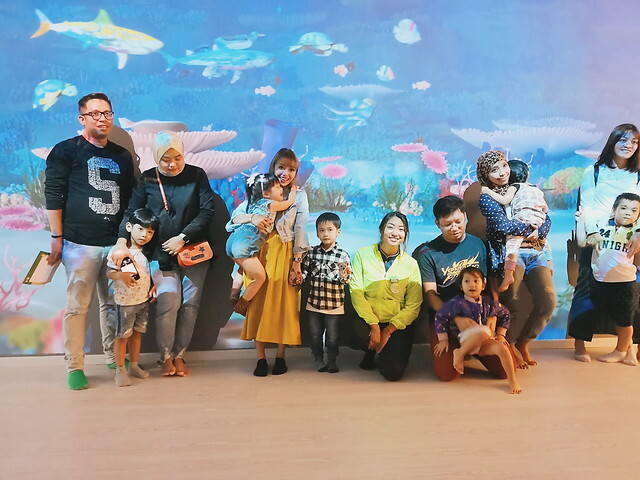 They’re actually having a school holiday special now, normal price is RM 100 per class, but it is RM 38 until 31 January 2019. I’m thinking of taking Fighter again too, as new content will be added time to time. As mentioned earlier, Fighter and Penny joined the Curiosity Class (Age 5 – 8) but there’s also the Discovery Class (Age 9 – 12) which is more comprehensive. Each class is 2 hours long, with 15-25 students in each class. You can either book a class online HERE or via walk in, but by booking online you can book your time slot easier. PLUS I HAVE A DISCOUNT CODE FOR YOU GUYS! This blog post was written in collaboration with Green Guardian Plus.